Retaining users and facilitating their post-adoption are crucial for the success of mobile social networking sites (SNS). Drawing on the social support theory, this research examined mobile SNS continuance. The results indicated that both social support and technological perceptions affect continuance usage through trust and flow. Social support includes informational support and emotional support. Technological perceptions include system quality and service quality. The results imply that service providers need to offer a supportive climate as well as quality systems and services in order to facilitate users' post-adoption and continuance usage. Mobile internet has been developing rapidly in the world. Especially, the application of the fourth generation (4G) communication technologies has accelerated mobile internet development. According to a recent report, the number of mobile internet users in China has exceeded 656 million, accounting for 92.5% of its internet population (710 million) (CNNIC, 2016). In US, this ratio is 57% (Pew Research Center, 2013). Attracted by the great market, service providers have released a variety of mobile applications and services, such as mobile instant messaging, mobile payment and mobile social networking sites (SNS). They expect users to widely adopt and use these services. Then they can achieve competitive advantages and make profits. Nevertheless, only acquiring users and facilitating their initial adoption may be not enough for service providers. Users may discontinue their usage of the current service and switch to an alternative one. Thus, service providers also need to retain users and facilitate their post-adoption. Otherwise, they cannot make profits and achieve success. As an interactive application, mobile SNS have been popular among users. A few well-known SNS such as Facebook, LinkedIn, and QQ Zone have received wide adoption among users. However, intense competition exists among these mobile SNS. Thus, service providers have tried to retain users and expand their user base. Compared with traditional desktop-based SNS, a main advantage of mobile SNS is ubiquity. That is, with the help of mobile networks and devices, mobile SNS have freed users from temporal and spatial constraints. Users can conveniently interact with their peers and friends at anytime from anywhere. This provides an engaging experience to them. In addition, users may access mobile SNS to exchange social support. For example, they may expect other users to listen to them and express concerns, caring and empathy when they are in negative moods. They also expect other users to offer helpful suggestions and advice when they deal with problems and difficulties. If users received strong social support during accessing a mobile social networking site, they may form a commitment to it and continue their usage. 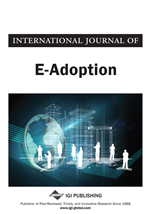 Extant research has examined SNS user adoption from multiple perspectives, such as the technology acceptance model (Zhu et al., 2014), self-regulation (Lin et al., 2014), social influence (Zhou and Li, 2014), perceived value (Yu et al., 2013), and push-pull-mooring model (Chang et al., 2014). Various factors such as perceived usefulness, perceived value, and sense of belonging are found to affect user behaviour. Nevertheless, the social support may also affect a user’s interactions with others and his or her usage behaviour. When users obtained helpful information and concerns from other members, they may develop identification with the community and continue their usage. Thus, it is necessary to examine the effect of social support on user adoption. This is the purpose of our research. We suggested that social support, which includes informational support and emotional support, may affect continuance usage. In addition to social support, we proposed that both technological perceptions of system quality and service quality, which are drawn from the information systems success model (Petter et al., 2013), may also affect continuance usage. Trust and flow, which represents an optimal experience, are included into the model as the mediators.